ABC774 shed 2.7 points to slip to 13.6% audience share overall. This is cancelled out the gain ABC's John Faine made in the previous ratings period. In the breakfast battle of FM stations, Triple M still leads despite shedding 0.2 points to 8.3%. SCA stablemates, Fox's Fifi and Dave, gained a solid 0.4 share to edge second with 7.1% audience share, while similar gains have Gold (6.8%), Kiis (6.7%) and Nova (6.1%) slowly gaining share in a competitive market. In the drive slot, 3AW's Tom Elliot has taken top billing gaining 1.8 share points to 11.7% audience share. This bumped Fox's Hamish and Andy into second, still with a 10.5% audience share. Gold clings onto third despite, shedding 0.5 points to 8.9% audience share. Matt and Meshel, in only their second ratings period, gained 0.4 points to 8.8% aiudience share while Nova's Kate, Tim and Marty have made solid headway, gaining 1.1 points to an 8.6% audience share. Brisbane's 97.3FM has seen a 1.7 percentage point rise in overall listenership, taking it to 13.7% audience share and upholding its first place position ahead of Nova with 11.7% audience share. In third place, hit 105.3 upped its total listenership by 1.1 percentage points, and continued to dominate in the 18-24 demographic with 38.1% audience share. In the breakfast slot, ABC 612's Spencer Howson continues to dominate with the show increasing its share by 0.5 percentage points on last survey, taking it to 14.6% audience share. Robin, Terry and Bob at 97.3 FM have gained 1.9 percentage points, holding second place and held its 13.5% audience share. Hit 105.3's Hamish and Andy have overtaken Nova’s Kate Tim and Marty for the Brisbane drive slot, increasing its audience share by 2.1 percentage points to 14.6% audience share. Nova held its 14.5% audience share, followed by 97.3FM who increased its audience by 2.3 percentage points to 13.6% audience share. Nova 93.7 remained in second spot in breakfast, with 14.4.3%, having scored an extra 1.1 percentage points. It's followed by SCA’s Mix 94.5 which grabbed a 12% share. Kiis hosts Kyle and Jackie O have held onto their lead in the Sydney FM breakfast stakes, despite dropping 1.2 percentage points, while 2DayFM's Rove and Sam remain flat on the second survey of the year. The Kiis duo landed on 11.3% audience share, below AM stations ABC702 on 11.4% audience share and long-running winner of the breakfast charts, 2GB's Alan Jones on 15.3% audience share. Southern Cross Austereo's (SCA) Rove and Sam stayed stable from the previous survey on 3.0% audience share. 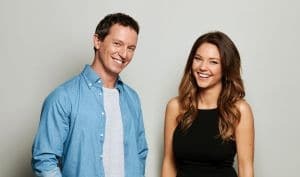 Things also look good for Kiis in drive time, with hosts Hughesy and Kate remaining well ahead of the competition on 10.7% audience share despite dropping 0.9 percentage points from last survey. ABC702 picked up 0.2 percentage points to reach 10.0% audience share followed by TripleJ on 9.6% audience share. 2GB's Ben Fordham jumped 0.7 percentage points to reach 9.2% audience share. Nova's Kate, Tim and Marty, who spent most of last year topping drive time dropped 1.3 percentage points to land on 7.8% audience share, followed by Triple M on 7.0% audience share. 2DayFM's Hamish and Andy picked up another 1.1 percentage points with 6.6% audience share. Did you catch the first radio ratings of the year?